Lock in a great price for Binalong Motel – rated 8.5 by recent guests! The check in process were really easy, the staff were happy and welcoming. Nothing seemed too much. As the hotel is off the main street, it is very quiet. Very clean motel and very nice gentleman on reception who allowed me to check in. Although we didn’t use it, we booked due to having a pool. Staff were friendly. I’ve stayed here twice on overnight stays and found it to be clean and comfy with friendly staff. The room was appropriate for the one night stop over that I required. Owner was very friendly couldn't do enough for us, A little bowl of chocolates in the fridge and snacks. The bed was comfy. The Manager was very helpful and friendly. It was lovely and close to the best Chinese Restaurant we have been to. And there were free maps of the surrounding areas at reception. 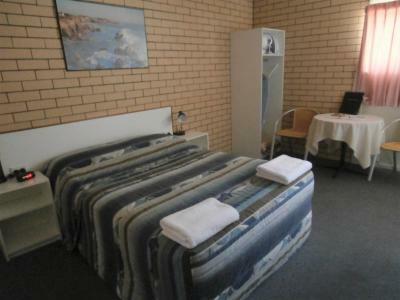 Binalong Motel This rating is a reflection of how the property compares to the industry standard when it comes to price, facilities and services available. It's based on a self-evaluation by the property. Use this rating to help choose your stay! 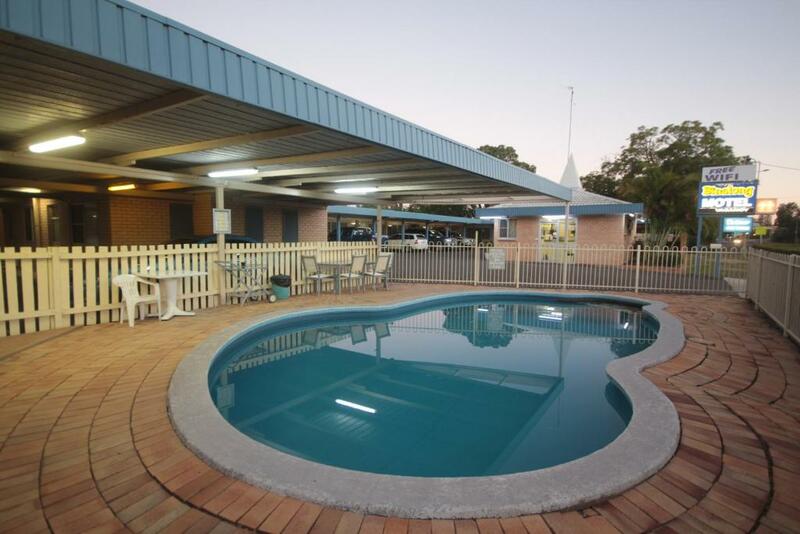 Offering an outdoor pool and free Wi-Fi, Binalong Motel is located in Goondiwindi. All rooms offer a flat-screen TV and a desk. Guests enjoy free on-site parking and BBQ facilities. The air-conditioned rooms feature a dining setting, a refrigerator and tea/coffee making facilities. Each room includes a bathroom with a shower, a hairdryer and towels. Binalong Motel Goondiwindi is 5 minutes' walk from Customs House Museum. It is 5 minutes' drive from Serpentine Lagoon and the Natural Heritage Water Park. When would you like to stay at Binalong Motel? This air-conditioned room offers a queen-sized bed, 3 single-sized beds, a flat-screen TV with cable channels, a refrigerator and tea/coffee making facilities. Free WiFi is provided. This room type is not pet friendly. Please note the maximum occupancy is 5. This air-conditioned family room offers a queen size bed, 2 single beds and a set of bunk beds. It has a flat-screen TV with cable channels, a refrigerator and tea/coffee making facilities and free WiFi. This air-conditioned room offers a queen-sized bed, flat-screen TV with cable channels, a refrigerator and tea/coffee making facilities. Free WiFi is provided. This air-conditioned room offers a double bed, a flat-screen TV with cable channels, a refrigerator and tea/coffee making facilities. Free WiFi is provided. Under new management since May 2016. 3 pet friendly rooms available (2 Queen rooms and 1 Twin room). Please contact us for availability and conditions. Located in a quiet part of town yet close enough for a short walk to the main street. House Rules Binalong Motel takes special requests – add in the next step! Binalong Motel accepts these cards and reserves the right to temporarily hold an amount prior to arrival. Payment for your booking will appear as ‘Accommodations Payment Services’ on your bank statement. If you expect to arrive outside reception opening hours, please inform Binalong Motel in advance, using the contact details found on the booking confirmation. Limited pet-friendly rooms are available, for further information please contact the property in advance, using the contact details found on the booking confirmation. We moved the beds and underneath were kids under wear that didn't belong to us. Had kitchen plates and cutlery. The bed was very hard. I have a bad back so it has set my recovery back a few weeks. My family had no issues with it though. Little dated but price appropriate. Neat and tidy friendly helpful staff. - free wi-fi was non existent; not impressed. Does it get disconnected after 9pm at night?